Australia’s largest engineering faculty, UNSW Engineering enrolls 16,000+ students, and is a powerhouse of innovation. 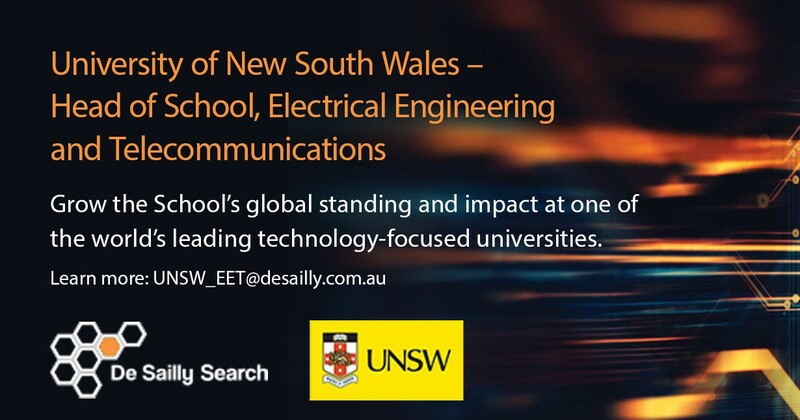 The School of Electronic Engineering and Telecommunications is one of eight Schools at UNSW Engineering. Electrical Engineering and Telecommunications is one of the largest postgraduate schools in the country and it conducts research in Energy Systems, Nano/Micro Systems, Systems and Control, Telecommunications and Signal Processing. Cross discipline research widens the range. School researchers work in The Australian Centre for Space Engineering Research, the Australian National Fabrication Facility, the Australian Research Council (ARC) Centre of Excellence in Quantum Computation and Communication Technology, Centre for Energy and Environmental Markets, Signals, Information and Machine Intelligence Lab, the UNSW Digital Grid Futures Institute and CSIRO’s Data61. The School community has just moved into a completely refurbished building equipped with state-of-the-art facilities for teaching and research. Full applications must be submitted to the email address above. Prospective candidates are encouraged to contact the search firm to obtain the brochure and position description, and for a confidential discussion early in the process. five nominated referees who can speak to the applicants’ experience relevant to the appointment, including administrative leadership. Referees will not be contacted until later in the process.